For decades Afghanistan and Pakistan have struggled with distinct, but intertwined security challenges analogous governance problems. Intense political contestation and violent conflict and weak state capacity in both countries have impeded internal development as well as regional cooperation in what is otherwise a neighborhood of great economic potential. Moreover, terrorism and a significant number of nuclear weapons and stockpiles have made the region a top global security concern. As the U.S. military presence in Afghanistan winds down this year, there are significant questions as to what the ripple effects and outcomes might be. To explore these questions, Brookings India held a foreign policy panel discussion on the current situations and future trajectories of Afghanistan and Pakistan, featuring Dr. Vanda Felbab-Brown, Senior Fellow, Foreign Policy, the Brookings Institution, Washington D.C. and Amb. Cameron Munter, former US Ambassador to Pakistan (2010-12) and moderated by Dr. Subir Gokarn, Director of Research, Brookings India. The discussion focused on the respective challenges, risks, and opportunities in Afghanistan and Pakistan with particular attention to the implications of U.S. foreign policy. The speakers concluded that despite serious destabilizing security and governance threats, state failure and civil war are not inevitable in either country. Rather, multilateralism and creative cooperation based on constituencies who share common goals could provide a modest foundation for long-term stability. The reduction – and possibly even total departure – of American military forces in Afghanistan this year will have serious negative repercussions on the country. While some U.S. military personnel are likely to remain for counterterrorism and advisory support to the Afghan forces if a new Afghan government signs the Bilateral Security Agreement with the United States, by 2016 only about one thousand American soldiers are expected to remain in the country, primarily for the protection of the US embassy. This leaves the Afghan security forces alone to fight the Taliban and deter other fragmentary forces that may want to alter the political dispensation to serve their parochial economic, tribal, and other interests. Although the Taliban increasingly faces significant logistical and legitimacy problems and the Afghan security forces have scored tactical successes against the insurgency, the Taliban is nevertheless entrenched and nowhere close to being defeated. The Taliban insurgency remains optimistic that time is on its side and its relative balance of power will grow stronger. Moreover, the Afghan security forces are suffering likely unsustainable casualty levels and without external support will continue experiencing major deficiencies in critical enablers, such as logistics, intelligence, and medical evacuation, all impacting on troop morale and potentially creating serious recruitment and retention problems. Moreover, for years and years to come, the Afghan security forces are fully dependent on external funding, with the Afghan government unable to generate resources to maintain the forces. Despite significant efforts to broaden cooperation, U.S.-Pakistani relations have remained focused on counter-terrorism. Long-term stability has been elusive, however, and the bilateral relations of the U.S. and Pakistan, from arming against the Soviets to the Abbottabad raid, has been characterized by mistrust and perceived betrayal on both sides. While the relations between the US and Pakistan remain heavily intertwined, the “double game” is dysfunctional and impedes cooperation and mutual goal attainment. The departure of U.S. troops from Afghanistan in 2014 allows for a new look at relations with balanced elements of security and other factors, especially economic ones. In Afghanistan, poor governance underlies violent contestation, political fragmentation, and strengthens the Taliban insurgency. The political dispensation of the past decade faces a large legitimacy crisis, Many Afghans see their government as an essentially predatory mafia, which does not deliver essential services and acts with impunity. It is not clear whether the political arrangements can be sustained without significant reforms. The presidential elections dispute between candidates Ashraf Ghani and Abdullah Abdullah has no easy technical solution, despite the total recount of eight million votes that is currently under way. With substantial fraud believed to be committed by both sides, a negotiated political deal will likely be necessary to decide the outcome. Nonetheless, a negotiated political outcome that essentially redivides patronage among top-level powerbrokers and their networks risks preventing the new government from undertaking the necessary reforms that can strengthen its legitimacy with Afghans as well as external donors. While the U.S. policy to date has assumed that reforming existing Pakistani institutions can improve governance, significant reform has proven unattainable. American policymakers efforts in the post-Musharraf era to provide civilian aid, build dams, and fight polio were not successful. Ultimately America has not succeeded in stemming feudalism or corruption in the political system in Pakistan. Yet civil war is not at all inevitable. There are significant centrifugal forces that threaten national cohesion, but rather than focusing on these factors individually it will be more useful from a foreign policy perspective to focus on building good governance in the center. Governance may be the key to security, not the other way around. Afghanistan faces an imminent and potentially drastic decline in foreign aid. Yet the Afghan government will not be financially sustainable without external assistance for years and years. Foreign aid effectiveness and economic growth and income generation through the exploitation of Afghanistan’s vast mineral resources, are critically inhibited by extensive corruption as well as insecurity. Although mineral extraction licenses have been issued to China and India, little production has taken place. The reduction of U.S. military presence in Afghanistan will likely also translate in substantially decline in U.S. and foreign aid. The September 2014 NATO summit on Afghanistan and the Afghanistan Trade and Investment Conference in London are two important opportunities for Afghanistan to resurrect foreign support and revive commitments to its stability and growth. But it will only be able to do so if it demonstrates a strong determination to reduce political tensions in the country, undertake governance reforms, and implement greater accountability and rule of law..
A multilateral approach defined by collective decision-making and rule setting may be a more sustainable way to promote leadership and accountability in the country. Similarly, diplomacy and aid to Pakistan have occurred mainly through a U.S.-led, bilateral framework. The result has been a narrow policy agenda that lacks support and cooperation even among immediate neighbors. Indeed greater South Asia is one of the least multilateralised parts of the world. In setting rules, multilateral platforms allow for a degree of predictability and could promote pursuit of broad and incremental goals, such as increased trade and protection of mutual investments. Over the past six years, the Barack Obama administration’s response to terrorism threats facing the United States has shifted away from nation-building in weak states towards to a policy of disrupting anti-American terrorist groups through targeted strikes. One implication is that Afghanistan will not be a priority for the United States Nonetheless, the United States can and should continue to support stability in Afghanistan, including by supporting the country’s security forces and efforts to improve governance. Even as uncertainty and hedging characterize Afghanistan’s internal political dynamics and external environment, the United States should break with preoccupation with short-term anti-terrorism expediencies and emphasize long-term state-building and greater government accountability. Going forward the United States and the international community must “widen the aperture” to involve regional states such as China, Iran, and India, as well as non-governmental stakeholders to contribute to a more integrated vision for Pakistan, Afghanistan, and the region overall. In Pakistan in particular there is scope to engage constituencies that have common goals and interests, such as the business community or philanthropic sector, both of which have vibrant potential and are cause for optimism. Rather than turn away, the international community should cultivate these germs of a positive collaboration, though perhaps with more modest expectations, to help the region set its own course for stability and peaceful cooperation. *Intern David Seidenberg contributed invaluably to this report. **Like all products of the Center, this report is intended to contribute to discussion and stimulate debate on important issues. 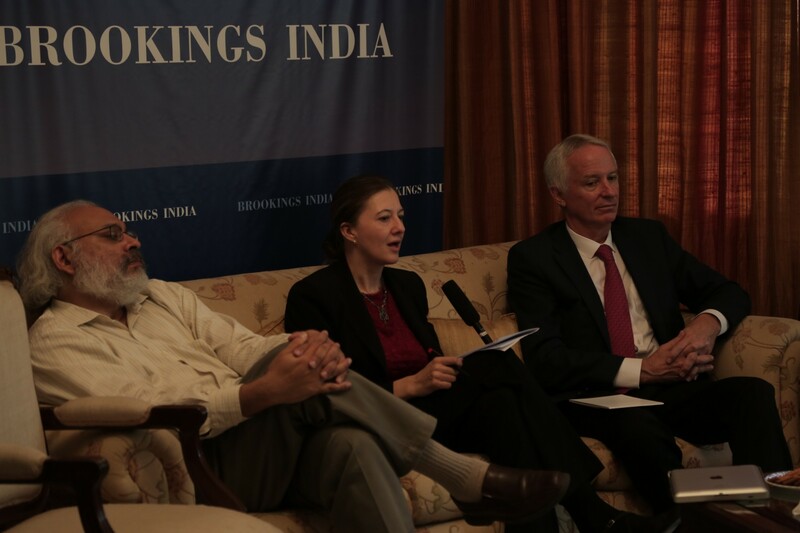 Brookings India does not hold an institutional view on any subject.